Move over Spring, it’s every driver’s favourite time of year: pothole season. As we head into Spring, temperatures are fluctuating like a speedometer, and that means we’ll start seeing more potholes popping up on our roads. More than just annoying, this problem costs our city millions of dollars to repair each year. It also costs unsuspecting drivers. As temperatures go above and below freezing, water inside the asphalt of our roads begins to expand and melt. As this happens, parts start to crack and create the potholes we all love to hate. For some context into just how big of an issue this is, by the beginning of March 2019, the city of Toronto has repaired about 14,000 potholes. Historically, the annual average is about 200,000 for the municipality. That’s just in Toronto. 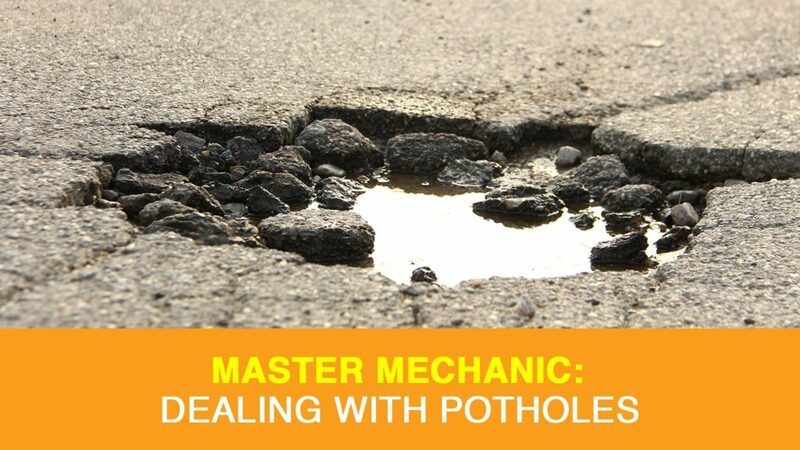 We caught up with a Master Mechanic to find out how you can best protect your car from potholes and when a repair is necessary. If you live in the GTA, chances are you’re driving past or over potholes every single day. Knowing how to handle potholes safely is crucial to keep you, other drivers, and your car safe. Distance: You need to keep a safe distance between your car and the vehicle in front of you. This will make it easier to spot potholes on the road ahead of time so you can react accordingly. Puddles: You should also use caution when driving over pools of water on the road. There’s no indication of how deep the puddle is, and this could be a pothole in disguise. Speed: Sometimes you can’t avoid a pothole. It’s always better to drive over a pothole than to risk cutting someone off. If you can’t maneuver around a pothole, slow down and grip the wheel tightly with both hands so you don’t lose control of your vehicle. Your car is manufactured to handle some bumps in the road, but it needs to be maintained properly to do so. To minimize the damage a pothole can inflict on your car, ensure your tires are inflated to meet the manufacturer’s specifications. Above other risks, an under-inflated tire may not provide enough of a cushion against a pothole, which can cause damage to your rim or tire wall. A properly tuned suspension will also help protect your vehicle and brace the impact of a pothole. If you’re not sure what your car’s specifications are–or you suspect your suspension needs a tune up–contact your local Master Mechanic today. In addition to damaging your tire, potholes can throw off your alignment and cause problems with your suspension. If you hit a big pothole, there are a couple warning signs that you may have inflicted damage. If you notice any of these issues, it may or may not be caused by a pothole. In any case, these aren’t usual driving symptoms, and you should probably visit your local Master Mechanic either way. We’re always happy to help and will explain what we found before completing any repairs. The city of Toronto, and many other municipalities have people patrolling the roads to report potholes, but also relies on help from commuters. By calling the city hotline at 311, you can report a pothole which the city will try to repair within four days. If you live outside the city, contact your local representative to find out how you can report a pothole. Researchers at the University of Waterloo have been experimenting with artificial intelligence that identifies and logs road damage. Using a roof-mounted-camera, these vehicles use the same technology as Google Maps cars, but they survey roads instead of just photographing them.